Coach Wolf Finger and the Boca U23 men’s team got off to a good start on Sunday in the opening round of the 2008 Mid-Atlantic Summer Showcase League season at the Vineland Soccer Complex in South Jersey as they look to return to the MSSL Cup Championship in 2008. Jersey Shore Boca is participating in MSSL for the fifth consecutive year this summer as one of the league’s inaugural founding members. VINELAND, NJ (June 1, 2008) – The Jersey Shore Boca summer soccer program got off to a good start on Sunday in the opening round of 2008 Mid-Atlantic Summer Showcase League (MSSL) at the Vineland Soccer Complex in South Jersey as the Boca U23 men tied 2006 MSSL Cup Champions West Chester United (PA) 1-1 in their first match and then defeated Barrington Three Lions (NJ) 1-0 in the nightcap. Against the former MSSL champs, the Boca men opened the scoring in the middle of the first half as former Syracuse University standout Andrew Hawtin (Toms River) was taken down inside the penalty area by a West Chester defender as he moved toward the goal. Hawtin, a long-time Boca veteran who has played at every level within the Club, calmly stepped to the penalty spot and slotted the ball past the keeper for the team’s first tally of the season. West Chester came out hard in the second stanza and gained the equalizer with fifteen minutes left in the match after a cross from the left side was headed past Boca keeper Charles Cunliffe (Lakewood) to tie the score at 1-1. In their second match of the afternoon against a much improved Barrington team from one year ago, the Boca U23 men battled to a scoreless first half with a solid defensive effort from Rider University senior Collin Jennings (Wall), Montclair State University sophomore Michael Krol (Howell), Rowan University senior Andrew Finger (Mullica Hill) and Manhattan College junior James Gannon (Toms River). The second half began as intense as the first until Andre Ferreria (Howell) blew past the Barrington midfield on the left side then cut into the center of the pitch with ten minutes left on the clock. The speedy Ferreria, a former standout at Howell High School, ripped a thirty-five yard rocket into the upper right corner which would eventually seal the win for Boca. Cunliffe, who begins his sophomore year at Rowan University in the fall, came up big between the pipes for Boca making several key saves throughout the afternoon. 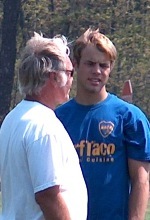 Former Neumann College (PA) assistant men’s soccer coach Wolfgang Finger returns for his second year in charge of the Boca U23 men’s team assisted by Philadelphia native and National Soccer Hall of Fame member Alex Ely who has 37 years of coaching experience including stints with numerous college and professional clubs. Ely also earned 4 international caps as a player for the US Men’s National Team during World Cup qualifying matches in the 1960’s and was indicted into the National Soccer Hall Of Fame in 1997. The Boca U23 men finished with an overall record of 5-5-6 during their 2007 campaign and scored a league-leading 32 goals, allowed 26 against them and recorded 4 shut-outs while ending the regular 2007 season in fourth place within a division of fourteen teams. The team was also invited to the USASA U23 Regional Tournament for a second consecutive year last summer and advanced to the men’s 2007 MSSL Cup Championship. Jersey Shore Boca is participating in MSSL for the fifth consecutive year this summer as one of the league’s inaugural founding members. MSSL is a regional summer soccer league, which is specifically designed for collegiate players under the age of twenty-three and is fully sanctioned by the United States Adult Soccer Association (USASA), the national governing body for adult amateur soccer. The Jersey Shore Boca summer soccer program is officially sponsored by Surf Taco, a popular Mexican themed restaurant chain with seven locations throughout the jersey shore.